As far as I can tell, Nelson et al. (2006) ‘Towards development of a high quality public domain global roads database‘ and Taylor & Caquard (2006) Cybercartography: Maps and Mapping in the Information Era are the first peer-reviewed papers that mention OpenStreetMap. Since then, OpenStreetMap has received plenty of academic attention. More ‘conservative’ search engines such as ScienceDirect or Scopus find 286 and 236 peer reviewed papers (respectively) that mention the project. The ACM digital library finds 461 papers in the areas that are relevant to computing and electronics, while Microsoft Academic Research finds only 112. Google Scholar lists over 9000 (!). Even with the most conservative version from Microsoft, we can see an impact on fields ranging from social science to engineering and physics. So lots to be proud of as a major contribution to knowledge beyond producing maps. Michael Goodchild, in his 2007 paper that started the research into Volunteered Geographic Information (VGI), mentioned OpenStreetMap (OSM), and since then there is a lot of conflation of OSM and VGI. In some recent papers you can find statements such as ‘OpenstreetMap is considered as one of the most successful and popular VGI projects‘ or ‘the most prominent VGI project OpenStreetMap‘ so, at some level, the boundary between the two is being blurred. I’m part of the problem – for example, with the title of my 2010 paper ‘How good is volunteered geographical information? A comparative study of OpenStreetMap and Ordnance Survey datasets‘. However, the more I think about it, the more uncomfortable I am with this equivalence. I feel that the recent line from Neis & Zielstra (2014) is more accurate: ‘One of the most utilized, analyzed and cited VGI-platforms, with an increasing popularity over the past few years, is OpenStreetMap (OSM)‘. I’ll explain why. 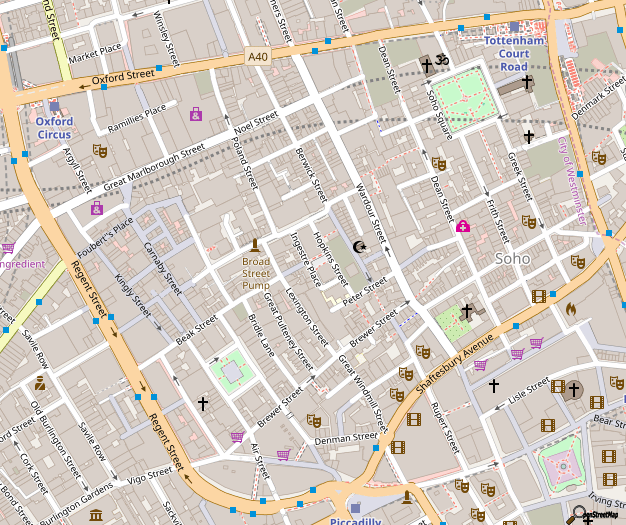 Let’s look at the whole area of OpenStreetMap studies. Over the past decade, several types of research paper have emerged. First, there is a whole set of research projects that use OSM data because it’s easy to use and free to access (in computer vision or even string theory). These studies are not part of ‘OSM studies’ or VGI, as, for them, this is just data to be used. Second, there are studies about OSM data: quality, evolution of objects and other aspects from researchers such as Peter Mooney, Pascal Neis, Alex Zipf and many others. Third, there are studies that also look at the interactions between the contribution and the data – for example, in trying to infer trustworthiness. Fourth, there are studies that look at the wider societal aspects of OpenStreetMap, with people like Martin Dodge, Chris Perkins, and Jo Gerlach contributing in interesting discussions. Finally, there are studies of the social practices in OpenStreetMap as a project, with the work of Yu-Wei Lin, Nama Budhathoki, Manuela Schmidt and others. In short, there is a significant body of knowledge regarding the nature of the project, the implications of what it produces, and ways to understand the information that emerges from it. Clearly, we now know that OSM produces good data and are ware of the patterns of contribution. What is also clear is that many of these patterns are specific to OSM. Because of the importance of OSM to so many application areas (including illustrative maps in string theory!) these insights are very important. Some of these insights are expected to also be present in other VGI projects (hence my suggestions for assertions about VGI) but this needs to be done carefully, only when there is evidence from other projects that this is the case. In short, we should avoid conflating VGI and OSM. Muki’s article is relevant to one of the outputs from the fem2map project. Discussing definitions is one of the most boring things that excite academics and hence leads to heated debate. In the conference paper “Gender dimensions in UGC and VGI – A desk-based study”, my co-authors and I were so ambitious that we tried to define not only VGI but also UGC – see [http://hw.oeaw.ac.at/?arp=0x002e6e72]. Perhaps naive, we thought we were doing a good job comparing OSM with other UGC and VGI projects. It’s an open call for criticism / feedback to this conference paper. Goodchild [2007b] defines VGI as a new phenomenon, which consists of GI contributed largely by untrained citizens on a voluntary basis. However, our framework (Figure 1) suggests that those who participate in VGI may be situated in different personal, social, and technological contexts, with different levels of intrinsic and extrinsic motivations and GIS expertise. While the major portion of data in VGI may continue to come from citizen volunteers, the reality is that other sources play an important role as well. …Thus, the VGI definition proposed by Michael Goodchild is somewhat limited, excluding participants whose contributions are not purely vol- untary or who are professionals. Previous Previous post: Happy 10th Birthday, OpenStreetMap!